Not long ago, Caffeine Magazine ran a twitter poll, asking whether people would drink capsule coffee (for example, using an Nespresso machine) if it tasted better. Without much thought, I answered no (along with 72% of the 251 respondents) revealing, in the process, a whole host of (my) prejudice and presumption. At about the same time, I received an invitation from coffee roasters, Assembly: did I want to come to a talk on speciality coffee in capsules? Well, no. Given by Maxwell Colonna-Dashwood? Okay, let me reconsider that… Yes, of course I do! For those who don’t know, Maxwell is the reigning UK Barista Champion, owner of Bath’s Colonna & Small’s and now a coffee roaster. He’s one of the British speciality coffee industry’s best-regarded figures and if he’s got something to say about capsules, then I want to hear it, regardless of my prejudice. So, on Thursday night, I made my way to Modern Society, a general-purpose store on Redchurch Street in Shoreditch (which just happens to have what I believe is the UK’s only full Modbar installation) to hear Maxwell’s talk. Did he challenge my preconceptions and prejudice? Did he, in fact, change my mind on capsules? You can find out after the gallery. Maxwell Colonna-Dashwood is the sort of man who puts his money where his mouth is. He wasn’t just talking about coffee capsules. No, Maxwell walks the walk as well. His company, Colonna Coffee, is starting production of Nespresso-compatible speciality coffee capsules, which will be available from the end of April (although if you want to get your hands on some, you need to pre-register for the early adopter capsule membership scheme). So, clearly, Maxwell believes in what he’s doing. This isn’t just speculative talk. Despite this, I went along in a profoundly sceptical mood. One of my reasons for saying no to the Caffeine Magazine poll is that I enjoy the rituals and rhythms of making coffee. Even if a capsule machine could make better coffee, I wouldn’t want one. Anyway, I thought, it’s a moot point, because (or so my inherent prejudice went) capsule coffee is inherently no good. I based this somewhat sweeping opinion on a combination of hearsay, (limited) experience and an inherent belief that a machine costing under £100 couldn’t possibly make decent coffee. I have a similar prejudice about batch-brewed coffee, by the way, which persists despite the fact I’ve had several extremely good batch-brewed coffees. Nevertheless, in my head, a batch-brewed coffee cannot be as good as one individually made, on demand, by a skilled barista. So, as you can see, ingrained prejudice/belief, can be very hard to challenge, yet, in the space of one evening, Maxwell managed it, pretty much turning everything I’d thought about capsule coffee on its head. To start at the beginning, the first preconception, one which the capsule machine makers also promote, is that capsule machines make espresso. Think of a capsule machine as another brewing method, somewhere, on the intensity scale, between espresso and filter coffee. A typical Nespresso machine uses 5.4g of coffee and produces a 30g drink. Compare this to a typical double espresso dose in a speciality coffee shop, where you put 18g of coffee in and get a 36g drink out. Clearly these are very different drinks. Filter coffee is even more extreme, by the way, usually having 18g in and 300g out! Maxwell compared the intensity of capsule coffee to that of a lungo, which I tried back in 2014 when I visited Colonna & Small’s. 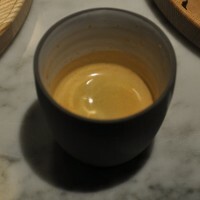 That used a recipe of 19g in, 70g out, extracted under five bar of pressure in 20 seconds, which is similar (in ration) to Maxwell’s recipe for the Nespresso machine of 5.4g in, 22g out, also with a 20 second extraction (but in this case using 16 bar of pressure!). So, to start with, we need to judge capsule coffee for what it is, not for what it isn’t. The second point that Maxwell made was about freshness. Capsule coffee has a reputation for being stale, the general preconception being that once the coffee is ground, it immediately starts to lose its freshness. Even vacuum sealing it in a capsule won’t stop this process, or so the conventional wisdom goes. Not so fast, says Maxwell. Not all coffee capsules are created equal. If you get the process right, you can create a decent vacuum and you can retain the coffee’s freshness. What’s more, capsule coffee challenges another myth of speciality coffee, that freshly-roasted coffee is always better than old coffee. This, according to Maxwell, misses the point that green beans age and that coffee roasted when the green beans are new is fresher than coffee roasted months later when the green beans have aged. To support this, he gives two examples involving Phil Robertson of Calgary roasters Phil & Sebastian. The first is a story Phil tells of how he holds back a (sealed) bag or two of coffee from an early roast, just after the new crop of green beans have arrived. Then, a few months later, as that particular stock of green beans is coming to an end, he compares the bag he’s held back with a freshly roasted batch of the same (but now old) green beans. Conventional wisdom says that the freshly-roasted coffee will be better than the bag that’s been sitting on a shelf for months, but in blind tastings, it’s the old beans that come out on top. The second example was when Phil came to visit Maxwell at the start of the year on his way to Ethiopia. This is a bad time for a roaster to show off his wares, since most of the new crops haven’t come in yet, so Maxwell’s freshly roasted coffee all came from old green beans. Maxwell served Phil a variety of coffee over a period of several days and, when it came time for him to leave, Phil, completely unprompted, confessed that the best coffee he’d had was from one Maxwell’s capsules. Unsurprisingly, this had been roasted four months earlier, when the new crop of green beans had just arrived. So, it’s not just that capsules can keep the coffee fresh. In some circumstances, it can be fresher than newly-roasted coffee. The final point I took away from the evening is that capsule coffee makes the conversation with the customer much easier. Those of us in (or in my case, on the periphery of) the speciality coffee industry have to realise that we are not typical consumers. The conversation I have with Maxwell when I visit Colonna & Small’s is very different from the conversation he has with a typical customer who has just bought a bag of coffee and wants to know how to make it at home. This, Maxwell confessed, is frequently a frustrating conversation. It starts with “how do I grind it?” and goes on to cover a whole host of factors, all of which are out of his control. What’s more, all of these variables play a role in determining how his coffee tastes. In contrast, capsule coffee takes away all those variables. The coffee is specifically roasted for capsules (when roasting for capsules, Max tends to roast a couple of minutes quicker than he otherwise would), it’s already ground and the capsule machine provides very reliable, consistent extraction. In fact, aside from the coffee going into the capsule, the main other variable is the water the customer puts in the machine (which is a whole different discussion that I’m going to skip over since this post is long enough already!). Capsules also open up the average consumer to the concept of origin and the differences in flavours/tastes. As Maxwell points out, it’s quite rare for a consumer to do a side-by-side comparison of different types of coffee at home. As an aside, it’s quite rare for someone like me to do it either and I have at least 10 different origin coffees available to me. However, the faff of grinding two different beans, then making two cups of coffee, just so I can compare them, is too much. On the other hand, if I had a capsule machine and all I had to do was pop in two different capsules… Well, that’s a different story (and one that existing capsule manufacturers are already exploiting). It also makes experimenting much easier: when you’re paying up to £10 a bag for 250g of speciality coffee, buying several bags of different coffee that you might not like is quite a disincentive. However, buying a sampler pack of several different single-origin capsules is a very different matter. So, capsule coffee can bring speciality coffee to a wider market and get more people drinking better coffee. The final, and obvious, question is, what does Maxwell’s capsule coffee actually taste like? Well, Maxwell had brought along three different capsules/coffees, a Colombian, a Rwandan and one from Panama, which I tried. With my palate, I’m not the ideal person to pass judgement, but I found it a sweet, smooth and, above all, very drinkable coffee. The bottom line (and, in my case, the only real test that matters) is, would I drink it by choice? The answer: a resounding yes! Will I now go out and buy a capsule machine? Probably not, but that’s more to do with me and the fact I like making coffee. A capsule machine still feels too much like cheating. However, turn things around. What if I already had a capsule machine? In this case, I’d have signed up for Maxwell’s early adopter scheme when I got home on Thursday night! If you’re curious to see it for yourself and are going to the London Coffee Festival, Maxwell will be launching the capsules there. See what else is going on with my Festival Preview. Since it’s been generating a lot of comment on twitter, I thought I would touch on the environmental issues (a topic large enough to warrant an article, or articles, in its own right). Coffee capsules have a reputation of being environmentally unfriendly, although Maxwell’s capsules, like several other leading brands, are 100% recyclable. However, as Maxwell pointed out in the talk, the difficulty is in getting people to actually recycle them (an added complication being the need to separate the coffee grounds from the capsule). On the plus side, capsule machines are very energy efficient, using considerably less electricity per shot than a typical home espresso machine. Speciality coffee in capsules seems to be taking off. I tried an excellent Ethiopian single-origin from Neighbourhood Coffee at the Manchester Coffee Festival, while I’m also aware of both Pact and Roastworks Coffee offering speciality coffee capsules. If you are roaster (or you know of one) offering speciality coffee capsules, please let me know. You can see what London’s Best Coffee made of Maxwell’s talk in it’s very informative article, while Daniel of Cups of Coffee London presents an interesting viewpoint. It was also covered in Issue 20 of Caffeine Magazine. December 2016: Speciality Coffee in Capsules? has won the 2016 Most Popular Coffee Spot Award and was a runner-up for the 2016 Best Saturday Supplement Award. This entry was posted in Discussion, Information by Brian Williams. Bookmark the permalink. Interesting that in blind tastings old roasted beans beat freshly roasted beans – from the same batch of green beans. I wonder if any UK roasters have carried out that experiment and would care to share the results? Thanks for the article… very interesting read.